Considering the development of modern communications networks, to find a long-lost friend, forgotten classmate or expensive human heart, with which the connection was lost, you can not leave the house. Enough to know his name and to be able to use the global Internet. Not everyone knows, But the site search engine to find a person by name, name or nick. they, who every day use such search, can confidently say, that coordinates the Internet can find a large part of the inhabitants of the land. for example, you long ago lost touch with a good friend. Memory erased from the head address of his home, even in the name of doubt. Open Yandex or Google, are driven into the search box the name of a friend and watch matches, that you will be given the lines below. If you know a person's age, is looking for, this information can be recorded, separated by commas. If you remembered the name of his forgotten friend, it can also add good luck in finding a person by name. Sometimes the network can be published articles, resume or literary activity of the people, we seek. If the general search, you do not succeed, select the tag “blogs”. People love to chat. Perhaps your friend for a long time maintains his own blog, which records the thoughts, memories or shares experiences with virtual readers. The online marketplace impersonal, and many choose it is not the real name, and coined the nickname. In other words – “nick”. If you remember some nickname of a loved one, It may be the second name, name, obtained christened, it is quite possible you will be able to guess his nickname on the network. For such a search must be well aware of the, who are looking. Another sure way to how to find a person by name – try to search the one or more social networks. To do this, log in to your account in the “Classmates”, “Vkontakte”, “My world” or “Facebook”. In each network there is a search field, which it is written in detail how to find a person by name, the name or place of residence. You only need to drive data, limit the search by region, age or country, and carefully examine the outstanding results. 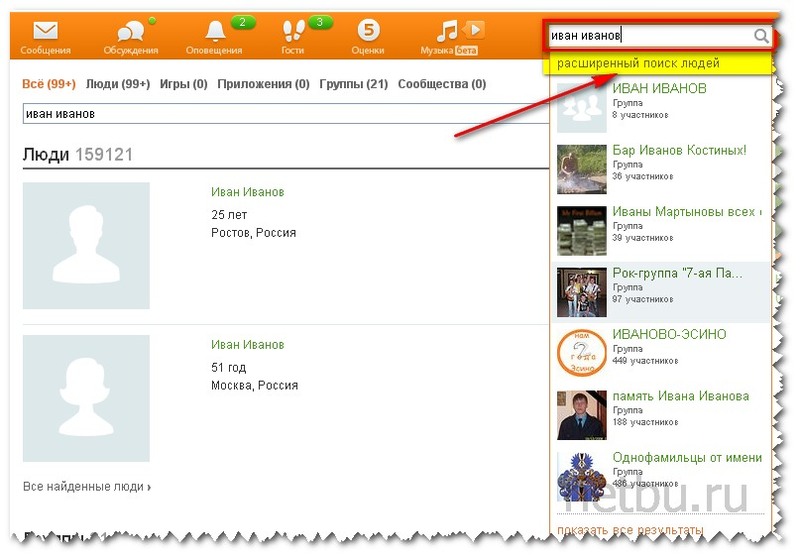 Search the social network is good, it allows you to look at photos of, who are you looking for. You can get an idea of ​​life, hobbies and prosperity of, who is on the photo. Or try to find someone with the help of mutual friends. To do this, go to a mutual friend and there choose the tab “Friends”. Then simply compare the photos and names. It may well be, that he, who are you looking for, disappeared under a different name. As for such nuance woman search, after a few marriage leaves her former surname. If it is possible to track down the man not only by his surname, but at his post, do not leave it in the closet. Usually, many e-mail systems store addresses, where the letters were sent throughout the existence of the box. You need to dig into your address book, or ask it to make mutual friends. Since, on the Russian television there was a program “Wait for me”, Internet search multiple sites and resources have been organized. there are sites, where you can try to find a person by name among the other in long lists. There is a site of the program, where you can request a search, all known data of the person and his photo. Also, on the Internet there are several resources, offering help in the search for missing people. If it's a simple restoration of communication, it is possible to find a specialist, ready help for a fee. If it is an urgent search, eg, close cousin left home in an unknown direction, and you are not a little alarmed, you can apply to volunteer service to search for missing. See for yourself – ways that, how to find a person by the name of the Internet is actually a set. It depends on you, which method to choose, of you and of your desire to return the man in your life.